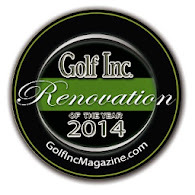 Seems like just yesterday we were rebuilding all the bunkers on the golf course. The truth is our bunkers are no longer "new". Believe it or not this picture was taken nearly 6 years ago. That may or may not sound like a long time to you but lets look at it another way. If we assume the golf course sees about 15,000 rounds a year (which I think is very conservative) and just one out of ten golfers hit into this bunker on #6 (I think that is definitely conservative), then that means at least 9,000 people have played from this bunker. That means 9,000 times someone has walked into this bunker and 9,000 times someone has walked out of this bunker. Let's not forget that almost every day one of my staff walks into this bunker in order to ready it for play. Each time someone enters a bunker they take several steps around it so it's not a stretch to assume that there has been tens of thousands of steps taken around this bunker. Maybe this doesn't sound like a big deal to you but when I look at it this way I'm not at all surprised that some of the bunkers are looking tired and worn out. Some of the bunkers are simply bushed and need help. Specifically, look at the edges of the bunkers. Even on steep areas like you see here, there are mashed down edges caused by people entering and exiting. These mashed down areas have become steps and are getting used as such over and over. This is starting to cause a serious problem. Balls are literally getting hung up in these areas which is a serious penalty. Bunkers are supposed to be a penalty but the incidence of "unplayable lies" is becoming way to frequent. I'm telling you all this to say that we are taking serious steps to resolve the situation. Here's a brief description of what we are doing. 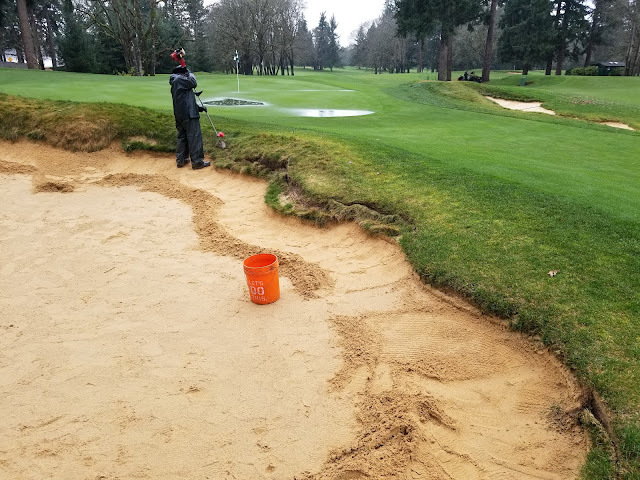 The first thing we do is pull away the sand from the edge so we can get a good look at what needs to be done and also so we can set the sand aside to be used again once repairs are finished. Then we cut out the edge of the bunker so that we once again have a nice vertical face that clearly defines the hazard and hopefully permits balls to enter the bunker and roll down away from the face. Some of these cuts we're making are pretty severe but our goal is to minimize the disturbance and retain as much of the bunker's original "character" as possible. The sand that was set aside is then raked up to the new edge. With the mashed down edges removed the bunker has a more defined look but it's a little harder of a step in and out in these areas. That's hopefully going to encourage people to enter and exit where they should which is on the low side of the bunker, but one thing I've learned is if a golfer is capable of jumping in and out over a high lip they will do so in order to reduce the disturbance of bunker sand and therefore reduce the amount of raking required after they've taken the shot. Here's a picture of how this bunker looked when we finished up repairs. 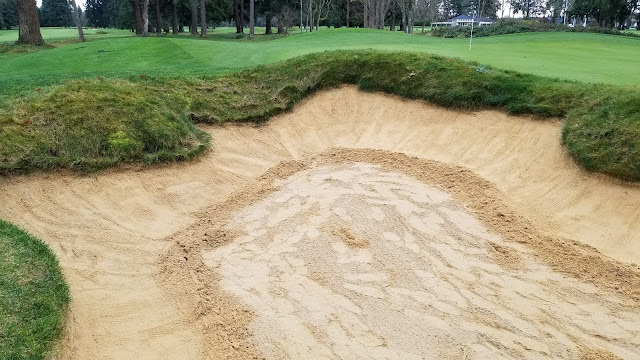 Our unique bunkers come with some unique challenges but we're also addressing a common issue that occurs on virtually all bunkers and that is "sand blast build up". This occurs from blasting out sand from repeated bunker shots. 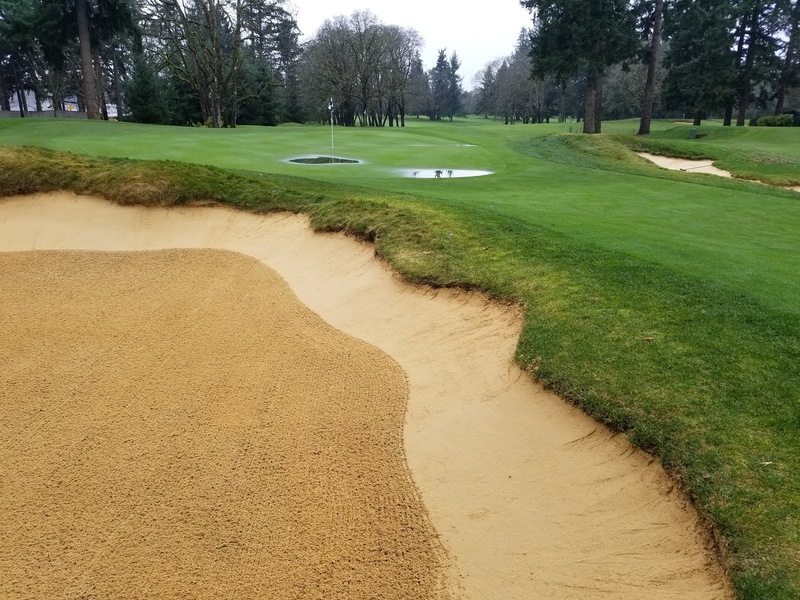 The blasted out sand can build up quickly on a bunker which sees a lot of action. 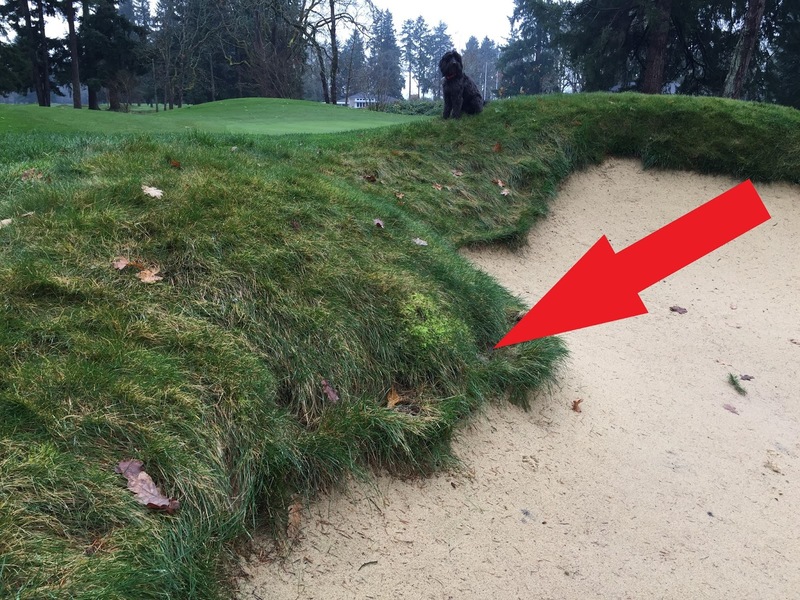 There's no surprise this problem is most common on practice bunkers. Here's a couple of pictures I took this week as we removed the build up of sand on the face of our practice bunker.